The following steps will guide you on how to add product options, such as sizes, colors and etc for your products. 1. Login to your Wordpress Admin, go to Products > Attributes. 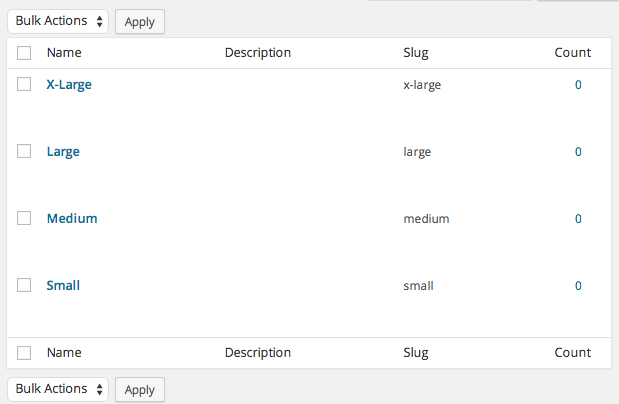 Input the Option Name and Slug, then click on Add Attribute. 2. Once you've added the Main attribute, click on the name on your right and you can continue to add the options values inside it. 2. Go to Product Data section, change to Variable Product (1), Select 'Size' and click Add (2), type the sizes you want to include in the box (3), tick both of the boxes (4), click save (5). 3. Then go to Variations tab on the left, choose 'Create variations from all attributes", then click Go. Click OK on the pop up message and wait a few seconds. 4. After that all the sizes you selected will appear. Click on each size and input the Price for each sizes. Other fields can be left blank if unrelated. 5. Once done, click Save changes. Then Update the Product page as well.